Meet Interim Dean of Students Argyle Wade! Welcome! One of the most important (and frankly, fun) parts of my job is to welcome (and welcome back) students to campus each semester. It’s tradition. And as you might know, tradition is big here at UW-Madison. Some of you are new to UW-Madison, either transferring from another university, or new to college life altogether. Many of you are returning students, eager to start the spring semester off right. Regardless of who you are or where you’re from, we are GLAD you are here! Make the most out of your time on campus and be sure to try something new: Attend Wisconsin Welcome events, ask professors about doing research, consider an alternative spring break, or volunteer! My colleagues at the Division of Student Life offer services and opportunities that are at your fingertips — Take advantage of them! Click here for a full list of Argyle’s office hours. Welcome Back for Spring Semester! Former DJ and current Dean of Students, Argyle Wade, hosts his very own radio show at 12 pm every Thursday on WSUM 97.1. Tune in to learn more about student affairs with a sprinkle of dad jokes. Send in your own questions using #BascomBeat on Twitter. 4-12-19: This episode features special guests Marisa Miller, peer advisor for International Academic Programs (IAP) and Bri Raymer, marketing specialist for IAP to discuss studying abroad. 4-5-19: This episode discusses growing in college and how to make the most of your time on campus. The second half features special guest Patrick Sims, the deputy vice chancellor for diversity and inclusion. 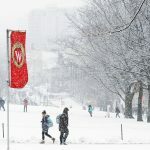 3-29-19: Bascom Beat returns from Spring Break. This episode features special guest Jenny Damask, the Alcohol, Tobacco, and Other Drugs Program Coordinator for University Health Services. 3-15-19: This episode features special guest Magnolia Decker from Student Print to discuss the role of Student Print on campus. The second half discusses Spring Break. Click here to see every episode of Bascom Beat. Feedback, questions or accessibility issues: dean@studentlife.wisc.edu.